Although Idaho has the reputation of being one of the most conservative states in the union, we have managed to escape most of the ugliest anti-GLBTQ legislation from being passed. In large part this has been to the previous and continuing work of YFFN and coalitions formed with other Idaho Progressive organizations. We monitor our city, county and state government to prevent discriminatory legislation from being passed and whenever possible to promote legislation that will protect the rights of the GLBTQ community and to extend basic human rights to all of Idaho’s citizens. 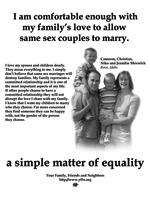 Additionally YFFN provides education to the non-GLBTQ community about the status of the rights of GLBTQ people in Idaho. We do this through speaker’s bureaus, visiting workplaces or classrooms, conducting workshops and communicating to local media. Lobby Skills and Message Trainings are available to interested people. Please contact the office if you are interested. Other organizations that help with GLBTQ issues: YFFN is exceptionally grateful to the many other organizations that assist in its activities. Consider joining these organizations, or donating to them if you do not already do so: ACLU, The Interfaith Alliance, Idaho Women’s Network, United Vision for Idaho.